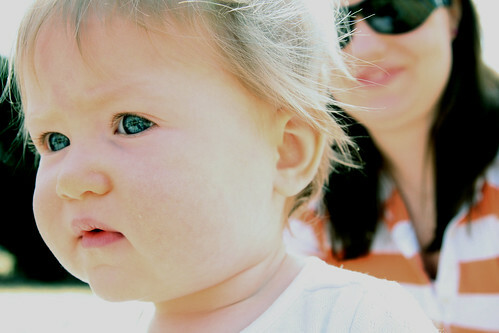 >I took this picture last weekend of my niece. Obviously, it's ridiculously overexposed. We had been sitting in the shade and then moved to full sunlight and I wasn't paying attention to my settings (*sigh*). But when I saw this on the computer, I fell in love with it. I mean, just look at those eyes! Photoshop to the rescue! I adjusted the levels, boosted the contrast very slightly and brought down the brightness, then applied an Unsharp Mask to the whole image and, voila! I'm so happy I was able to save this one!